SEATTLE -- The number of people sickened in an E. coli outbreak linked to Costco chicken salad will likely grow over the next few weeks, even though the product has been removed from store shelves, the federal Centers for Disease Control and Prevention said Wednesday. The spread of foodborne illness takes time to track, especially when it's happening in multiple states, said Dr. Robert Tauxe, deputy director of the CDC's Division of Foodborne, Waterborne and Environmental Diseases. State health officials, particularly those in Utah, discovered the outbreak and helped find the links between the 19 illnesses in seven states, Tauxe said. "Very quickly they noticed these people did have something in common. They really liked and ate the rotisserie chicken salad," he said. 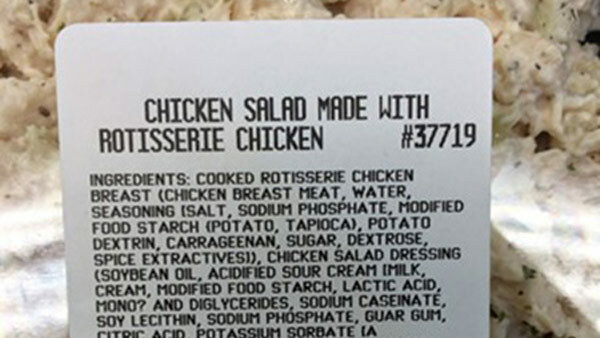 The big-box retailer based in Issaquah, Washington, pulled the chicken salad off store shelves nationwide, posted signs in its stores and provided detailed purchase logs to the CDC to help it track who bought the product and where the salad ingredients came from, Tauxe said. Costco has not returned multiple calls seeking comment. The strain of Shiga toxin-producing E. coli can be life-threatening, but no deaths have been reported. Five people have been hospitalized, including two with kidney failure. The CDC has been told they are all getting better, Tauxe said. The CDC has identified a DNA fingerprint of the E. coli strain connecting all 19 patients. As health departments get more reports of foodborne illness, additional people will be checked for the fingerprint and the case count will likely rise, Tauxe said. "All the evidence that we have points to this chicken salad," he said. "The Number 1 question we're working on is: Was there one ingredient of the chicken salad that was the source of the E. coli?" Then, officials will determine where that ingredient came from and if it was used in any other Costco products. Tauxe emphasized that the agency does not have any evidence that other Costco food was contaminated. Investigators are testing food removed from the stores, including chicken salad and other products, and talking to those who have gotten sick. All but two have reported eating the chicken salad made and sold by the retailer. Six people got sick in Montana, five in Utah, four in Colorado, and one each in California, Missouri, Virginia and Washington state. The CDC said the illness reports began on Oct. 6 and involved people from age 5 to 84. Health officials urged people who bought chicken salad at any U.S. Costco store on or before Friday to throw it away, even if no one has gotten sick. The Costco-linked illnesses are not related to a recent E. coli outbreak tied to Chipotle that sickened more than 40 people. Chipotle voluntarily closed 43 restaurants in Washington and Oregon and reopened them after deep cleaning and ordering new ingredients. Tauxe said both investigations are ongoing and he hopes they will eventually find the exact cause of both outbreaks. "I think we're going to learn something important from both ultimately," he said. Health officials urge anyone with these symptoms, especially people who have eaten Costco chicken salad, to go to their doctor.